AV Music Morpher Gold is an advanced music editing software for creative DJ and home music studio. This DJ software is distinguished with real time morphing algorithms: change voice, change tempo, add beats, and apply effects. You can morph live to listen to music in your taste, and for another choice you can click "Morph" to save the morphing settings as new file. Music Morpher is more powerful with audio manipulating tool to copy, cut, paste sample segments and mix multi tracks in wave chart. The Wave Editor is an easy wave editing tool, which can exempt you from buying another audio editing program like Sound Forge. Gold Edition features new Voice Extractor and Voice Remover to split singer voice and music of a song. Now you can mix and play instruments for a famous singer in a song. Gold Edition also features various DirectX effects added to the huge library of editable and mixable effects, and an easy music library organizer. Music Morpher Gold includes an MP3 recorder and a jukebox. 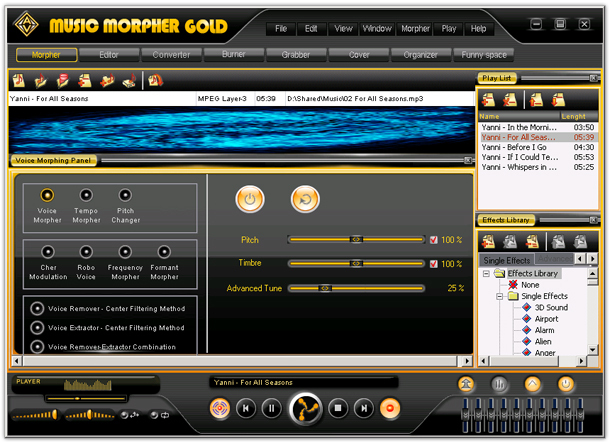 Unlike other MP3 players such as Winamp, MusicMatch, RealPlayer, Windows Media Player..., Music Morpher Gold can plays music and morph in realtime. Effect mixer and effect library are developed for you taste diversity. This music toolbox also works as an MP3 converter, very helpful in converting MP3 to WAV, WMA or any of 10 supported music formats. You will find Music Morpher Gold an easy CD creator with: CD ripper to rip audio tracks to hard disk, CD burner to burn audio file to CD, CD cover editor to design CD cover, inlay and label. This multi format music player and editor supports mp3, mp2, wma, wav, ape, ogg, au, irc. It is a great choice to play tracks in different formats, especially music downloaded from different file sharing systems such as Kazaa, iMesh, eMusic, Napster. Music Morpher Gold is compatible with karaoke player and plug-in. Ideal for morphing music live, remixing DJ music and medleys, making customized CD, karaoke CD, sound track, and audio clips. DJ, medley, remix, edit, morph Advanced music editing software includes MP3 player, audio recorder, voice pitch and voice timbre changer, tempo and beat morpher, effect mixer, voice remover, voice extractor, audio wave editor, mp3 converter, CD ripper and burner, CD cover creator.